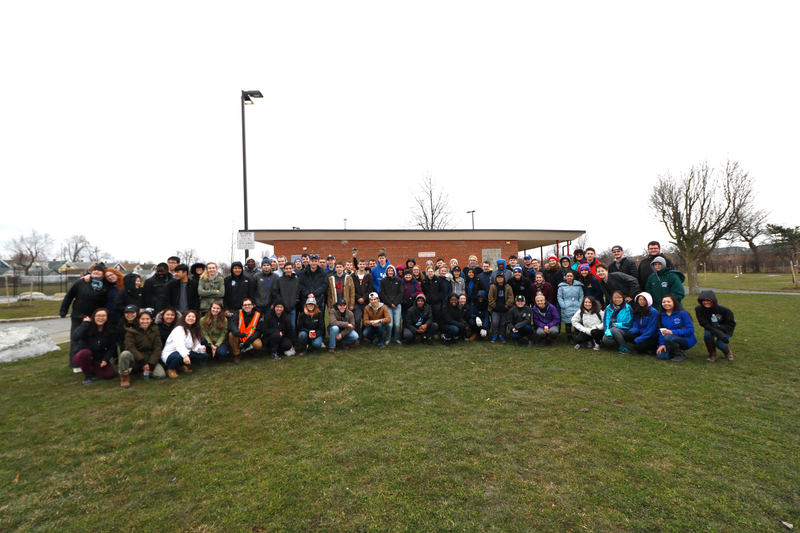 A big THANK YOU to the 80+ volunteers who braved the weather and joined the Tool Library and our partners for our 8th biannual ReTree the District Planting this past Saturday! A total of 40 trees were planted in Roosevelt Park and along Roosevelt Avenue. 30 trees planted in the park will help replace several dozen ash trees that were recently lost. 10 ornamental trees along Roosevelt Avenue will provide residents with a beautiful display as they bloom each spring. Since 2014, ReTree the District has planted 1,190 trees across Buffalo’s University District. It has not only been a way to replace the thousands of trees lost to disease, weather, and age, but also strengthen ties among neighbors, restore our parks and green spaces, teach the importance of urban ecology and encourage hands-on volunteerism. Donate to the project and help ReTree the District thrive for years to come! Your support will go directly to covering the cost of trees and equipment for each planting. A tree can be a natural air conditioner, producing the cooling effect of 10 room size air conditioners operating 20 hours a day. Trees can reduce noise by as much as 40%. Trees help settle out and trap dust, pollen and smoke from the air. Studies show that the more trees and landscaping a business district has, the more business will flow in. The beauty of a well-planted property and its surrounding street and neighborhood can raise property values by as much as 15%. Buffalo Green Fund, Buffalo in Bloom, Chestnut Ridge Nursery, City of Buffalo Division of Parks and Recreation, Dore Landscapes, Re-Tree WNY, Roosevelt Avenue Block Club, University at Buffalo (Honors College, WNY Prosperity Fellowship, Graduate Planning Student Association, Office of Student Engagement), University District Community Development Association, University Heights Collaborative, and many more!